RockDoveBlog published this article yesterday and thought you might enjoy reading about this Cool Duck. 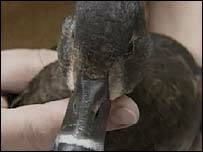 Also BBC’s article about this duck. This entry was posted in Birds, Birdwatching, Christian and tagged Duck, Florida, Hunter, James J.S. Johnson, Nature, Refrigerator, Rockdoveblog. Bookmark the permalink.